The Santa Rally describes the tendency of the market to rise in the last two weeks of the year. In 2017 the FTSE 100 Index had a return of +2.6% in the last two weeks of the year. So the Santa Rally effect held in 2017. As can be seen in the following chart, the Santa Rally has only failed to deliver in two years since 2000. 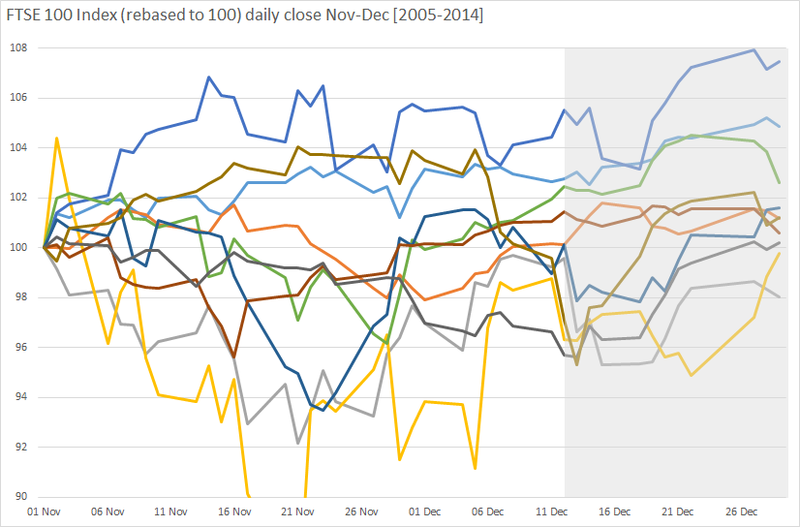 Does the equity market display any particular pattern in the days around Christmas and New Year? 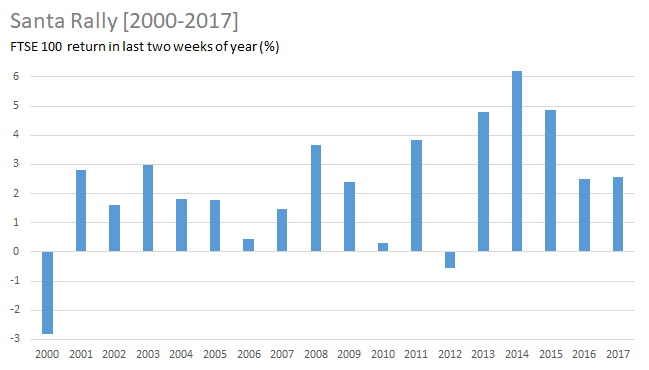 The following chart plots the average daily returns of the FTSE 100 Index for nine days around Christmas and New Year for the periods 1984-2017 and also 2000-2017. Days 1-3: the three trading days leading up to Christmas. Days 4-6: the three trading days between Christmas and New Year. Days 7-9: the first three trading days of the year. Market strength increases to the fourth day (the trading day immediately after Christmas). Since 1984 the fourth day has been the strongest day of the whole period, with an average daily return of 0.49% (albeit the volatility of returns on this day is high). Generally the profile of returns for the shorter time range (2000-2017) is similar to that for the whole period from 1984. The one significant difference is that since 2000 the strongest day of the period has been the first trading day of the new year. The new year generally starts strongly on the first day, with performance trailing off the following two days. The weakest day in the period is the third day of the New Year, followed by the last trading day of the year. Let’s now see if the pattern of positive returns confirms the above findings. The following chart plots the proportion of daily returns for the FTSE 100 Index that were positive on the nine days around Christmas and New for the period 1984-2017. For example, for 84% of the years since 1984 the returns on the day after Christmas were positive. The profile of behaviour demonstrated by the positive returns is similar to that for the mean returns above. So, how did equities perform last year around Christmas compared to the average behaviour seen above? The following chart replicates the first chart above with the average day returns for the period 2000-2017, and also plots the actual day returns for the nine days around Christmas in 2016. As can be seen, the actual returns last year roughly followed the average pattern since 2000: the strongest days were the days after Christmas and New Year, with performance quickly trailing off after New Year. 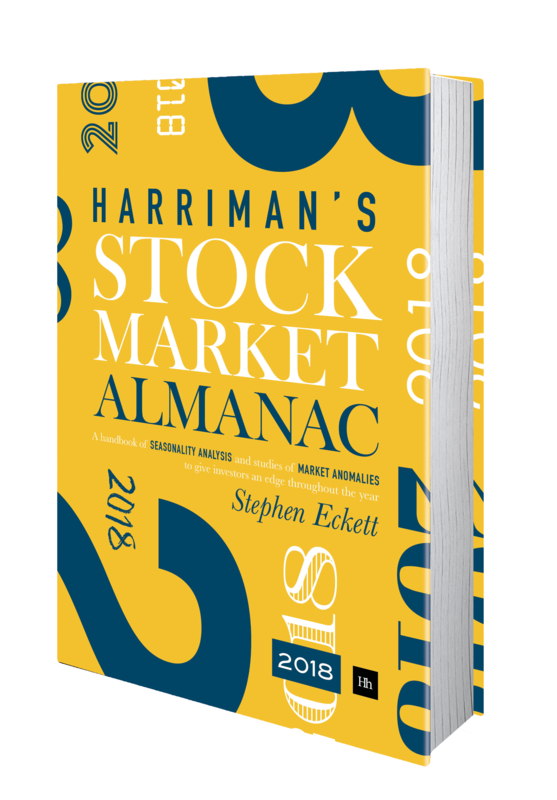 The above is an extract from the newly published UK Stock Market Almanac 2018. So, was there a Santa Rally in 2015? A previous article looked at whether the Santa Rally exists in the UK stock market. To recap, below is a chart from that article. This chart plots the cumulative average daily returns for the FTSE 100 Index for the month of December for the period 1984-2014. The conclusion of the article was that a Santa Rally can be observed most years, and that the rally usually starts on the 10th trading day of December. So, what happened in 2015? As can be seen, the Index fell fairly steadily for the first ten days of the month; a decline of 7.6% was seen over these ten days. On the 11th day the market rallied, and climbed 7.5% over the following nine days; before weakening slightly on the final two trading days of the year. 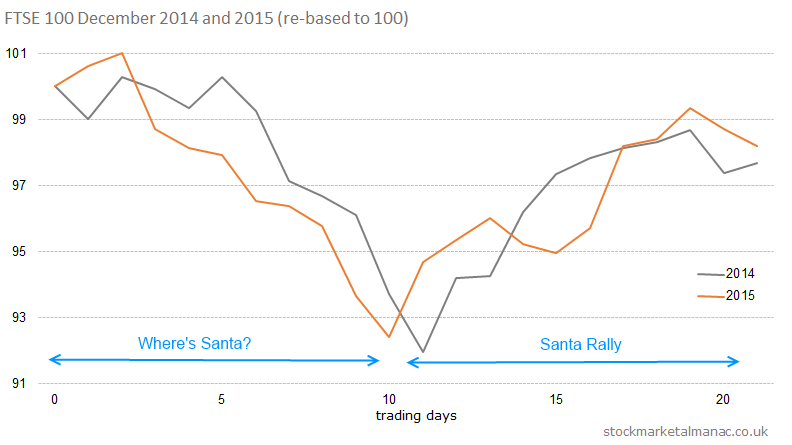 The 6.3% rally from the tenth trading day to the final day of the year can be considered the Santa Rally for 2015. For comparison, the Santa Rally for 2014 is also shown. In this case, the Santa Rally started a day later (on the 11th trading day) of December. In 2014 the Santa Rally returned 6.3%. So, December can be split into two periods: the “Where’s Santa?” period of the first ten trading days, when people ask if Santa is coming to the market that year, and then the period after the tenth trading day when a Santa Rally is often seen. Other articles on the Santa Rally. 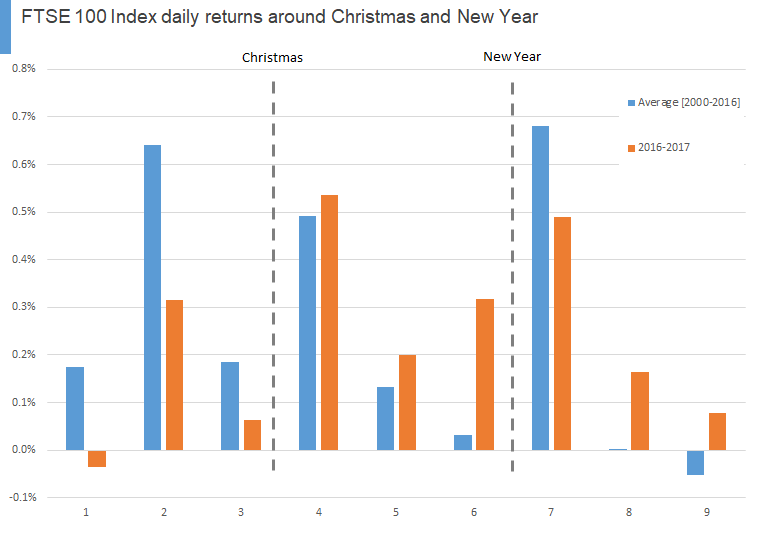 The following chart shows the average returns for these nine days around Christmas and New Year. The average daily change of the FTSE100 index from 1984 for all days is 0.03%, so it can be seen that all nine days around Christmas and New Year are stronger than the average daily returns for the rest of the year. 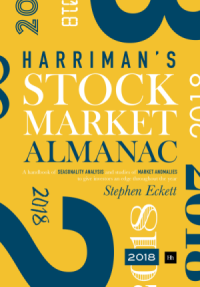 Generally, the market strength increases to the fourth day (the trading day immediately after Christmas) – this is the strongest day of the whole period, when the markets increases 83% of years since 1984 with an average return on this day of 0.47%. Although it should be noted that the standard deviation is the second highest on this day, meaning that the volatility of returns is greatest (the index actually fell 3% on this day in 1987 and 2002). The weakest day in the period is the third day of the New Year. The new year generally starts strongly on the first day, with performance trailing off the following two days. The following chart shows the proportion of returns that are positive for each of the nine days. The profile is similar to that for the average returns: the market is increasingly strong to the first day after Christmas, and then drops off after that. To check the persistency of these results, the following chart compares the average daily returns for each day for the period 1984-2015 (i.e. as above) with the shorter period 2000-2015. Broadly, the behaviour in the last 15 years has been similar to that for the longer period since 1984. The one obvious difference has been the extraordinarily strong average returns on the first trading day of the year seen since 2000. Extract taken from the newly published UK Stock Market Almanac 2016. The Santa Rally describes the tendency of the stock market to perform strongly in the final two weeks of the year (more info). All 10 stocks have positive returns over the two-week Santa Rally period for every year since 2005. The 10 stocks have the highest average returns of all FTSE 350 stocks over the Santa Rally periods of the last 10 years. The following table lists these ten shares and their average returns over the Santa Rally periods for the last 10 years. 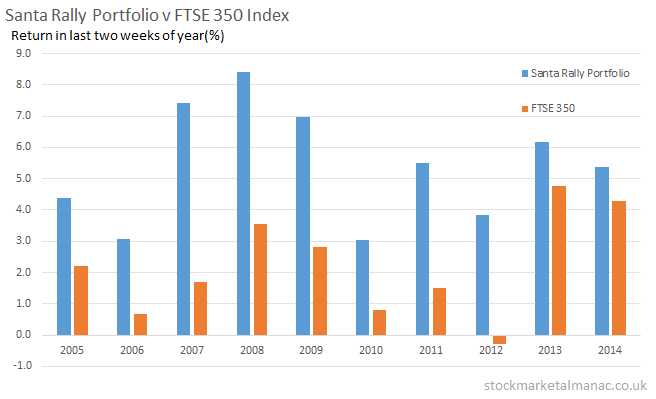 The following chart compares the performance of the Santa Rally Portfolio with the FTSE 350 Index for the past 10 years. The FTSE 350 Index has had positive returns in every Santa Rally period since 2005 except 2012. The average return for the Index over this period for the last 10 years is 2.2%. Last year, in 2014, although the Index was down 1.7% in December as a whole, it actually rose 4.3% in the second two weeks of the month. The Santa Rally Portfolio has had positive returns every year since 2005. The average return for the Portfolio over the last 10 years is 5.4%, thus out-performing the FTSE 350 each year by 3.2 percentage points. More on the Santa Rally. Does the Santa Rally exist? The Santa Rally holds that the market is strong at the end of the year (around Christmas). Is this true? 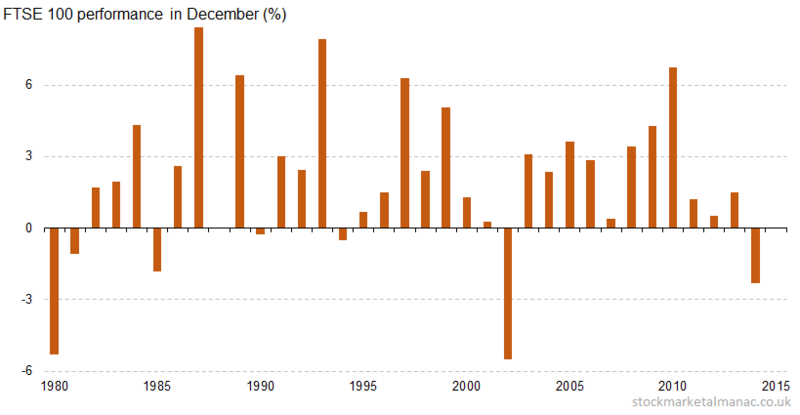 The following chart shows the average returns of the FTSE 100 Index for each of the 12 months for the period 1980-2014. Over this period the average return of the FTSE 100 Index in December has been 2.0% (the second strongest average month return after April). 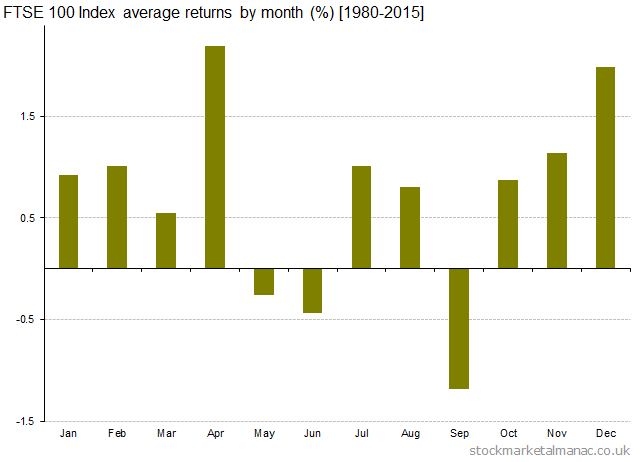 OK, so the average return in December is high, but is this attributable to just a few strong years? 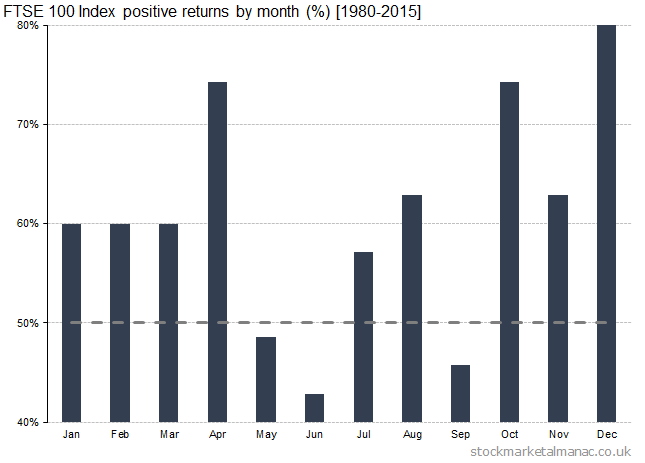 To answer this, the following chart plots the proportion of December month returns that were positive over the same period (1980-2015). By this measure, December is the strongest month in the year for the FTSE 100. In the 35 years since 1980, the Index has risen in 28 years (80%). The market strength in December can be seen in more detail in the following chart, which plots the actual return of of the FTSE 100 for each December since 1980. The Index has only fallen significantly in December in four years since 1980. Until last year (2014), the Index had been on an 11-year winning streak. When does the Santa Rally start? So, December is strong for the FTSE 100. But is it possible to determine more precisely when the Santa Rally starts? The following chart plots the cumulative average daily return of the Index throughout the year (more information about this chart). On average the UK market is strong from the start of November (this is a feature of the Sell in May effect). But we can also see an acceleration of the market at the very end of the year. To analyse this further the following chart plots the cumulative average daily return of the Index for December (i.e. the same chart as the above, but zoomed in on December). From this we can see that, on average, the market is flat for the first 10 trading days of December, after which it rises strongly. So, we can say that the Santa Rally starts on the 10th trading day of December. How has this played out in recent years? The following chart plots the FTSE 100 Index for the last two months of each year for the ten years since 2005. (The index values have been re-based to all start at 100.) The shaded area to the right indicates the final two weeks of the year. Yes, it’s something of a mess. So perhaps we can’t draw any strong conclusions. However, one can observe a slight tendency in most years for the market to rise in the final fortnight. What is the cause of the Santa Rally? Short answer: we don’t know? There is no definitive explanation for this effect. Although various reasons have been proposed, including: fund managers window dressing their portfolios, positive sentiment in the market caused by the festive season which is accentuated by low trading volumes, anticipation of the January Effect, and tax reasons (NB. “tax reasons” are often cited in the absence of any definitive explanation). The UK stock market does tend to be strong in December (although it wasn’t in 2014). Stocks accelerate upwards from the tenth trading of December (which in 2015 will be 14th December). It is this last hurrah of the market – in the final fortnight – that can be called the Santa Rally. The average return of the FTSE 100 Index on the first trading day of December since 1984 is -0.04%. We can also calculate the average return of the FTSE 100 Index on the second trading day of December – this happens to be 0.03%. We can continue this process until we have calculated the average return for the Index on each trading day of December since 1984. With these average daily returns, we can calculate a theoretical average FTSE 100 Index for the month of December. If this theoretical index starts at 100 then the index will have a value of 99.96 on the first day (after a fall of 0.04%), and 99.99 on the second day. The following chart plots the values of this theoretical average FTSE 100 index calculated from the average daily returns for December. Starting at 100 the theoretical index ends the month at 102.5 – reflecting the fact that the average return for the FTSE 100 Index for the whole month of December is 2.5%. One of the most remarkable features of this chart (and in fact for the whole year) is the strong performance of the market from the middle of the month. This surge in equities has been termed the Santa Rally (or the Christmas Rally). From the above chart it can be seen that on average the Santa Rally starts on the 10th trading day of the month. In the year 2014, the 10th trading day is the 12th December. Days 7-9: the first three trading days of the new year. And the following chart shows the proportion of positive returns on the nine days. The average daily change of the FTSE100 index from 1984 for all days is 0.03%; it can be seen that all nine days around Christmas and New Year have higher average returns than the average for all days. The strongest days are historically the two days leading up to Christmas and the two immediately following it. Generally, the market strength increase to the fourth day (the trading day immediately after Christmas) – this is the strongest day of the whole period, when the markets increases 81% of years since 1984 with an average rise of 0.34%. Although it should be noted that the standard deviation is the highest on this day, meaning that the volatility of returns is greatest (the index actually fell 3% on this day in 1987 and 2002). The weakest day in the period is the final trading day of the year – this is perhaps not surprising with traders closing positions for the year end. The new year generally starts strongly, but not as strong as those days of the week before.